Why are university unions important to students? This spring the iconic Michigan Union will temporarily close for a significant renovation project that will address aging infrastructure, improve safety, enhance student spaces, and restore the beautiful architecture. Much time and planning has been spent on making the transition a smooth and steady process. But you may wonder, "Why? Why are university unions so important to college students like mine?" From the very beginning of the renovation process students have been at the heart of it. 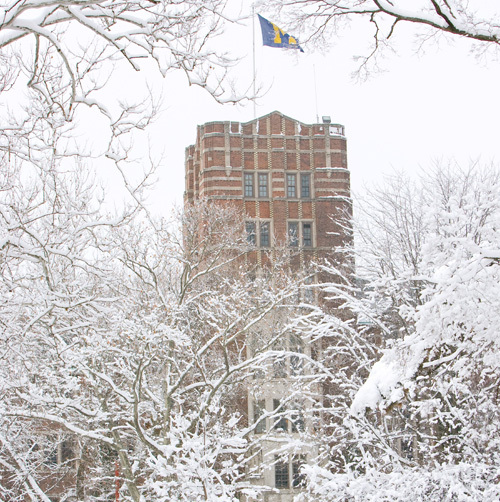 The Michigan Union Board of Representatives (MUBR) and the student organization Building a Better Michigan (BBM), were instrumental in surveying student support and successfully advocating for improvements to the Michigan Union. So, let's let the students tell you in their own words. Jason Comstock, former co-president of BBM, helped raise awareness about needed renovations. "We provided input to the architects and designers on what students would like to see in this project. We also toured the unions on other campuses to identify features of their buildings that we can incorporate into our own renovation." The Michigan Union dates back to the early 1900s. It was initially founded by students as a club, with the current building opening in 1919. It has always been a central location for student involvement, activism, leadership and social connection. "This renovation will bring the iconic building back to life and make the students excited about their Union again," Comstock explains. "My parents are Michigan alums and they have always been proud of their Union building. After the renovation, I hope to boast the same pride of the Union as my parents did when they attended this great University." Helen He, former MUBR chair, agrees. "Student input is critical to the Michigan Union renovation process. Thousands of students walk into the Union each day and their activity is what makes the Union thrive. Students provide a fresh and necessary perspective to the renovations and we hope that the end results will reflect what students have voiced," she says. The University of Michigan has three student union spaces -- the Michigan Union, the Michigan League, and Pierpont Commons on North Campus. For freshmen student Nick Schmidt, "The union has significant meaning to me as a student here at the University of Michigan. As a prospective student, the union was where my first ever tour of the university began and was the place where I got my first glimpse of what it was like to be a Wolverine. Now, I walk through the union almost every day and am constantly admiring its historical and architectural significance, as well as its significance to me as a college student. It is one of the most iconic buildings on campus and is a place that fosters to my needs, as well as the evolving needs of all Michigan students – which is what a student union should do. Overall, the Union gives me the feeling that I am home here at Michigan." Student Caroline Richburg says, "The Union was the first building I entered at U-M, I'll be back after graduation for a picture, and I come in multiple times a week to study, get coffee, or meet up with friends— the Union has been a central part of my college experience." At U-M, unions foster an inclusive community by providing iconic gathering spaces, engaging programs and needed services that enrich students' lives. The union's goal is the development of the student as a whole. Traditionally considered the "hearthstone" or "living room" of the campus, for generations these facilities have been more than buildings -- they have served as crossroads for the university community and have helped to shape campus life. "The unions also serve as places for getting to know and understand one another through informal association outside the classroom -- offering a place for students to get to know themselves, other students, and experience diversity and inclusion in a way they might not experience elsewhere," says Amy White, Director of the Michigan Union. This centerpiece of U-M campus activity since its construction in 1919 will continue to be a student-led project long after the doors reopen in 2020. And according to Nick, "I am most excited to see how vibrant and alive our Union becomes after the renovation. We have worked hard to create collaborative spaces, and I hope that when I walk in the Union a couple years from now, I will see people working together and building relationships; and also hear people talking, laughing, and spreading Michigan spirit."